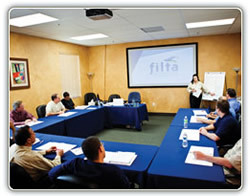 If you are looking for information on the Filta Environmental Kitchen Solutions franchise business opportunity, Filta Environmental Kitchen Solution franchises or Filta Environmental Kitchen Solutions franchising, then you have come to the right place. Your Partner on the Road to Success! Involves a weekly repeat service to each customer in an exclusive, protected territory. Can be run from home, with low overheads, simple administration and minimum stock. 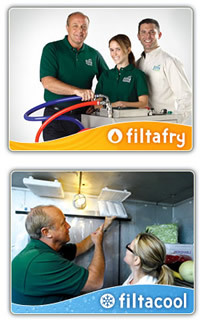 Our FiltaFry service is the undisputed market leader in cooking oil filtration & fryer management. The service is an eco-friendly mobile, on-site service for the micro-filtration of cooking oil and the vacuum based cleaning of deep fryers. FiltaFry's proven filter technology removes even the most minute pieces of food and other contaminants such as carbon, which break down the stability of oil. A regular FiltaFry service results in lower frying costs, longer oil life, improved food quality, and hygienically clean fryers. Other benefits include the reduction of frying odors, and improved health & safety for clients, customers and staff. In tandem with the FiltaFry service, our FiltaCool product/service, is also an undisputed market leader. We provide a cost-effective and eco-friendly solution to businesses that need to control moisture levels within walk-in units/walk-in coolers. Each FiltaCool container holds an air permeable packet of specially blended minerals that are scientifically proven to absorb excess humidity and gas molecules in refrigerators for up to three months. These results lower associated costs across the entire spectrum of cold storage operation: Food, Energy and Equipment. Our client base is ever growing and its comprised of hotels, restaurants, bars, office & factory restaurants, roadside diners, universities, sports venues, airports, fast food outlets, hospitals, schools - in fact anywhere food is fried and/or the presence of cold storage units. In addition, we provide comprehensive in-field and business training, toll-free call handling of potential customer queries in your territory, and first rate support and advice as you start and build your business. To ensure your success, one of our Business Development Managers will work with you in your own territory to help you establish a solid base of regular customers. Our training program can be mastered by anyone. We have franchisees all over the world, male and female, from all walks of life, some in business for the first time, others continued entrepreneurs. They are all individuals with one thing in common - the self-motivation and desire to run their own successful business as part of an even larger business. You could be in business for yourself but not by yourself, operating from the comfort of your own home. We have franchise opportunities in all states of the US and internationally in several countries.